How do you kill a Saint? Falcio, Kest, and Brasti are about to find out, because someone has figured out a way to do it and they've started with a friend. The Dukes were already looking for ways out of their agreement to put Aline on the throne, but with the Saints turning up dead, rumours are spreading that the Gods themselves oppose her ascension. Now churches are looking to protect themselves by bringing back the military orders of religious soldiers, assassins, and (especially) Inquisitors - a move that could turn the country into a theocracy. The only way Falcio can put a stop to it is by finding the murderer. He has only one clue: a terrifying iron mask which makes the Saints vulnerable by driving them mad. But even if he can find the killer, he'll still have to face him in battle. And that may be a duel that no swordsman, no matter how skilled, can hope to win. While I had some challenges with Traitor's Blade, Knight's Shadow was truly a must-read book, a title that I quite literally could not put down. 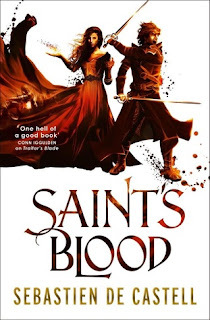 It was the kind of historical fantasy that makes everything else pale in comparison, and it has me ridiculously excited for the next book in the series. Hopefully the third one is even better then! Ooh nice! That's a totally new to me series! Looks pretty awesome! Sounds really interesting! I hope you enjoy it. Another highly anticipated book 3 in 2016! It was the opposite for me, I loved Traitor's Blade but had some mixed feelings for the sequel. But I am still looking forward to this and was mighty glad to hear that he didn't plan for Saint's Blood to be the end. So much to read, so little time. the cover is truly gorgeous!